A signature style for year-round wear, the Original Midlayer Gilet is a water-resistant wardrobe staple. 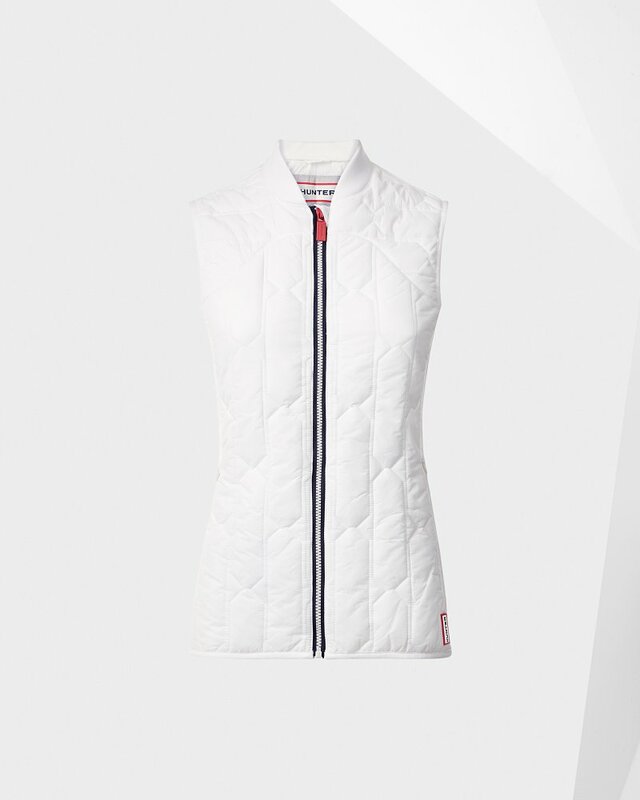 Lightweight with added insulation and a slim fit, this women's gilet is the perfect trans-seasonal layer. A durable water repellent finish has been applied for enhanced weather protection while the ribbed side panels, clean-cut white design and Hunter tri-colour zip achieve a stylish finish. Rated 5 out of 5 by Caroline11 from Love! I never would like wearing vests since I wouldn’t find any that would fit me due to my long torso but this one fits perfect! I’m 6,0” and sits on my body well. Wouldn’t definitely recommend for taller women. Rated 4 out of 5 by Anonymous from Great all day autum jacket with a minor fit issue The Hunter Gilet is a great all day jacket which will keep you warm and protect you from winds and rain. I wore the Gilet the last two weeks where ever it suited the activity, so basically during biking and all my activities outdoor. It kept me warm and also the style is pretty decent. Ok, personally my first thoughts were they are a lot of vests on the market, so what should be the difference to Hunter's Gilet? First things first, the quality is awesome! Everything is sewed perfectly, so full points here. The look is different to what you find from other brands. I would say the Hunter Gilet is looking good at almost any occasion. It is lightweight and durable. So no matter where you are and what your activity is, the vest will do a perfect job. Keeping you warm and well protected from the elements. But one thing was a little disappointing. The fit of the jacket at the neck area is pretty tight and if you close the zipper, the jacket will slip a little towards the neck and causing a kind of "roll" above your shoulders. Maybe should have taken one size up, but I don't think that is a size issue. That was the only reason why the vest didn't get full points. Over all the Hunter Gilet is a awesome companion for every journey. Rated 5 out of 5 by IrishMo from Favorite Addition to my Autumn Attire Comfortable and fashionable, perfect for those chilly days that you know will warm up quickly. Great first layer with a light sweater or shirt, it has because my go to vest as I head to the gym or hike through the canyon. Rated 5 out of 5 by Karins from Lightweight warmth The perfect add over a long sleeve shirt or sweater in our milder NC climate. Also great added warmth under another coat or raincoat. Inside pockets and outside zip pockets. Fits snug for warmth but has great stretch side panels for total flexibility and comfort. Rated 5 out of 5 by Tree from Excellent and superb product ThIs is a well constructed, well made product. I am extremely happy I got to test this product for HunterBoots. Does run a little smaller so may want to go up one size if you wear a sweater under it. Tremendous Gilet I recommend you purchase. You will be as pleased as I am. Rated 5 out of 5 by TessaJ from A Great Vest I would like to say that I have gotten to wear this every day but the day after I received it my 10 year old son stole it from me and I can barely get him to wear any other jacket or sweater out of the house. He LOVES it! It is very comfortable and well made. I ordered a Medium (I normally wear a 6-8 in womens clothing). Although it fits, it is a little snug. I would order a size up next time. I am looking forward to wearing this all winter (if I can steal it back from my son). Rated 5 out of 5 by meme77 from flattering and versatile This has been my go to jacket this fall. It is versatile because you can layer it on colder days or just wear it with a sweater on warmer days. The silhouette is slimming because of the length ways quilting and the back dips just the right amount over my rear hip area. There are two side panels that stretch and let the vest hug your curves so the vest is very feminine. The red zipper that says Hunter pops!! This is a quality, timeless piece that I will love for years to come. Rated 5 out of 5 by MariannaH from Love it!!! I fell in love with this vest when I saw it online and it didn’t disappoint once I received it. It looks great on it’s own and as a layer under a jacket. It is very flattering and super comfy; the quality of the vest is superb and I am sure it will last me many years! I got compliments on it every time I wore it, so thank you Hunter for another great product! If you are thinking about buying this vest stop thinking and just buy it, you will love it!